The last ecdysis of Libellula depressa. The last ecdysis takes place as the larvae have left the water. They do so after one or two years. The one year old leave the water during the second week of May. The two year old do so at the end of April. Almost all the emerging larvae do so within a week. 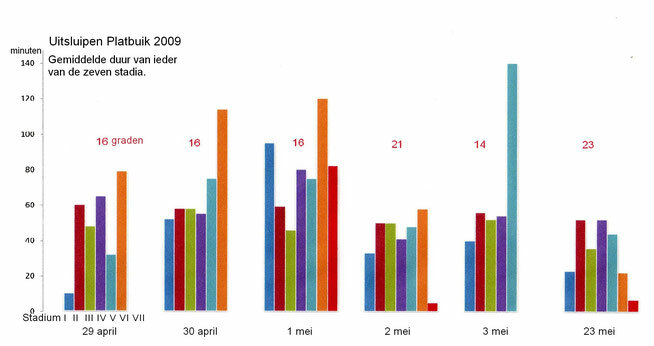 The ones that emerged in 2007 and 2009 did it during the last days of april and the beginning of may, whereas those from 2008 preferred the second week of May. This was not a matter of temperature. 2007 and 2008 were rather warm. Between 200C and 240C, and during the last days of april 2009 it was not warmer than 160C. In my opinion the larvae emerging in 2007 and 2009 developed in the water for two years and the ones of 2008 were so called one year larvae. Later on we will seen that this could also be an explanation for the long duration of stage VI in 2008. What I mean with stage VI is explained in the next section. 4. wings completely expanded and flight worthy”. These four stages are normally used. But my observations of L.depressa, both by eye and with the help of a digital camera with interval, made it possible to distinguish seven stages. Stage I. From attached till first split of cuticle. clear start of this ecdysis. of a support where ecdysis can start. This can be a time-consuming business. It makes a lot of difference to climb a support that grows in the water or to climb a wall at 3 meters from the water and than climb it to a height of more than 2 meters. the same time in all the individuals I observed. Stage III. From turning till filling of the wings. the “growth’ of the abdomen starts. Stage IV. From wings extended till filling of the abdomen till round. It was nice to see (and more or less astonishing) that at first the abdomen of L.depressa was round and later on gradually flattened. Stage V. From abdomen round till abdomen flat. Stage VI. From abdomen flat till wings spread. such as rain, it can be reversed. Stage VII. From wings spread till maiden flight, (on the same day). This 7 stages are also found for Libellula quadrimaculata and Orthetrum cancellatum. What can be learned from this seven stages? First of all, stage VI shows the longest duration in all the years of observation. The high values in 2008 and 2012 indicate that these are first year larvae. The muscles of the thorax being not strong enough for direct spreading of the wings. More energy is neaded. This can be supported by direct sun shine (radiant heat) or infra red light. (see 1 of 2 jaar). 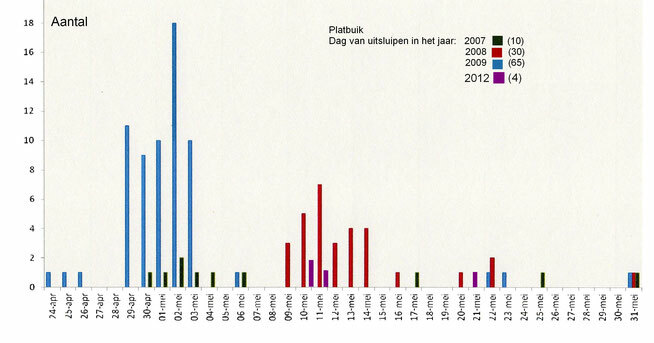 Graphic 2 shows the mean duration of the stages I till VII for the years 2007 and following. 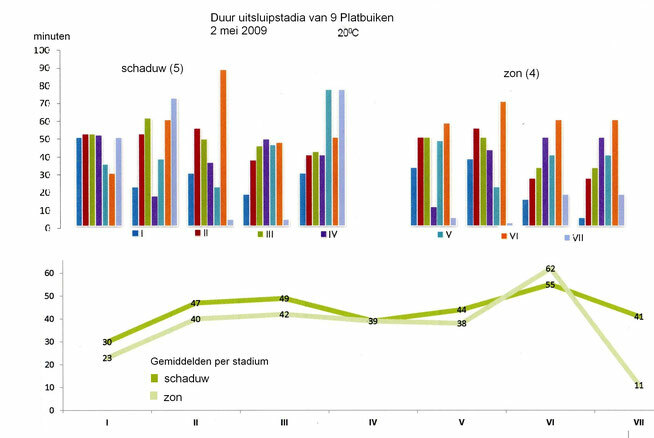 In graphic 3 is shown, the variation in the mean values per day. It is clear that there is a great variation in the duration of the stages. 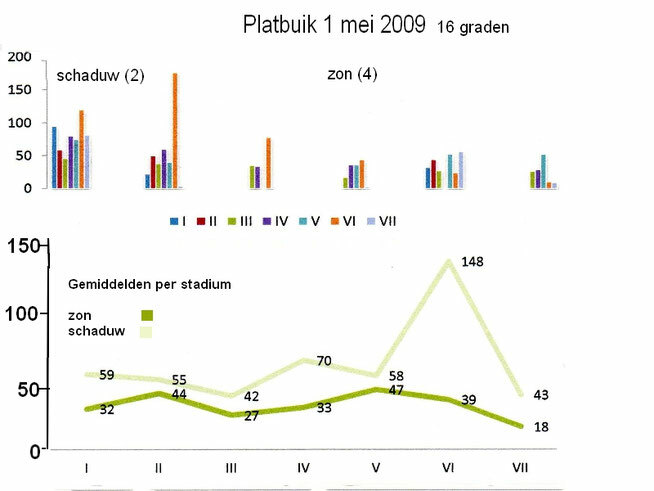 In graphic 3 is shown the mean duration of the stages I till VII for 5 days in 2009. The first two days stage VII lacks. That is, because no one made its maiden flight on the same day. On May 1st they all left, but each of the seven stages was considerably longer as the second of May.This is due to temperature. Maximum on May the first: 16 degrees, on May the second:21 degrees centigrade. The 3rd of May was extremely cold. No one left on this day. Nine were put in the sun (radiant heat) the next day. They all left within 30 minutes. The one I did not put in the sun on May 4th, stayed for 5 days. Temperature being not higher than 15 degrees. It left at May the 8th, as the temperature was more than 170C. On the 23rd of May only one emerged, but the duration of the stages is very similar to those emerging on the 2nd of May. Back to the 1st and 2nd of May. On the 1st of May I observed 10 emerging Libellula depressa. Only six of them could be used for detailed examination. 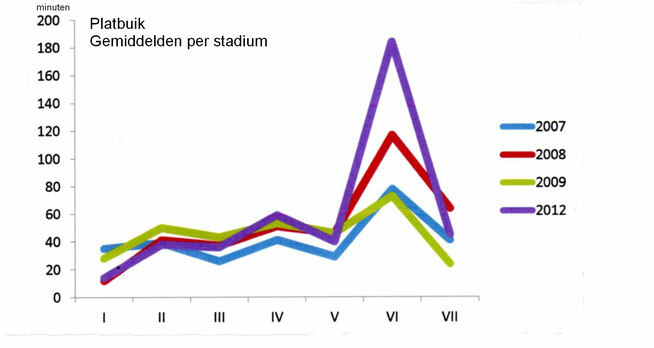 In the upper part of graphic 4 the mean duration of the seven stages is shown. It can be seen that, in general, the stages in the shadow are lasting longer than those in the sun. In the lower part is shown that indeed all the stages last longer in the shadow than in the sun. But stage VI, in the shadow, lasted much longer than stage VI in the sun. Now we turn to the 2nd of May. In the upper part we see again the great variation in mean duration of the different stages between different individuals. Here the difference between sun and shadow is much less than at the 1st of May. On the 1st of May the temperature was 16 degrees at maximum and on the 2nd of May the maximum was 20 degrees. Only in stage VII there is a gap of 30 minutes, in favor of those in the sun. That supports the idea that direct sunshine on the body is of great importance for being able to fly. in my garden in Haren, The Netherlands. The larvae of Libellula depressa leave the water after one or two years. They do so as the water temperature is 100C or higher. After having left the water they did not return, even if air temperature was 70C. Ninety percent of them emerging within one week. If they left the water after one year, they appeared during the second week of May. As they left the water after two years, first appearance was in the last week of April. “Higher temperatures may cause a two to three times faster emergency of dragonflies”. This statement is heard all over the entomologist world. But for my Libellula depressa it’s more complicated. First of all, what is temperature? Is it the temperature at 9.00, 11.00, 13,00 16.00 hrs. Is it the temperature at the moment of the start of the maiden flight? Or is it the maximum temperature on a day? For the reason of simplicity I have chosen the maximum temperature. And so I saw some interesting things. Below 160C: no maiden flight on the same day. Between 160C and 170C those in the sun developed two times faster than those in the shadow. Below 160C no maiden flight is possible. But if they were in stage VI or VII over night, and put in the sun next morning, even if temperature was 150C or less, maiden flight followed within half an hour. So, in my opinion, sunshine has a greater impact on maiden flight of Libellula depressa as temperature. At least at temperatures less than 170C. Stage I is fast and stage VI is slow. The rest of the stages are almost equally moderate, concerning maiden flight takes place on the same day. To start the maiden flight on the next day, direct sunshine on the thorax was needed at temperatures lower than 150C. If no direct sunshine is available, an infra-red lamp can replace it.